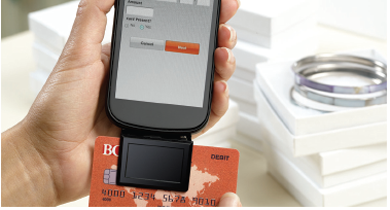 Accept payments wherever you go by turning your mobile phone into a point-of-sale terminal. Wherever your customers are, that’s where you’ll go – which means you need a payment solution that’s as mobile as you are. With the First Data Mobile PaySM solutions, you can offer fast, safe and flexible payment processing using your existing smart phone. First Data Mobile Pay App - A handy encrypting card reader device plugs into your mobile phone, enabling you to slide your customer’s credit card to capture a sale. Web-Based First Data Mobile Pay - Because the card is physically present, you avoid the higher card-not-present processing rates associated with hand-keyed transactions. You can accept payments wherever you have wireless coverage with your current data plan provider. Purchase no additional equipment, navigate to the First Data Mobile Pay URL and enter and transmit the customer’s credit card number. Save Money - Use the phone you always carry, rather than investing in a full-featured terminal. With the app version, pay lower card-present rates. Saves Time - Payments are processed in real time, with an e-receipt generated and sent to the customer via e-mail as soon as the transaction takes place. Fast Funding - You receive the fast funding that comes with instant authorization, and your customers can settle their purchases on the spot. Accept payments anywhere, anytime - Drive consumer’s payment choice and never lose a sale. First Data Mobile PaySM Solution provides secure login with user name, password and SSL encryption. Card data is not stored on your smart phone, and card numbers are truncated to keep your business and your customers safe from fraud.